Example 1 A golfer strikes a golf ball of mass 0.05 kg, and the time of impact between the golf club and the ball is 1 ms. If the ball acquires a velocity of magnitude 70 m/s, calculate the average force exerted on the ball. 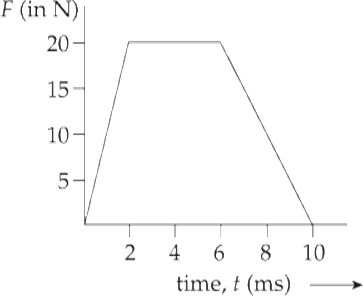 If a graph of force-versus-time is given, then the impulse of force F as it acts from t1 to t2 is equal to the area bounded by the graph of F, the t-axis, and the vertical lines associated with t1 and t2 as shown in the following graph. Example 2 A football team’s kicker punts the ball (mass = 0.4 kg) and gives it a launch speed of 30 m/s. Find the impulse delivered to the football by the kicker’s foot and the average force exerted by the kicker on the ball, given that the impact time is 8 ms. Example 3 An 80 kg stuntman jumps out of a window that’s 45 m above the ground. (a) How fast is he falling when he reaches ground level? (b) He lands on a large, air-filled target, coming to rest in 1.5 s. What average force does he feel while coming to rest? (c) What if he had instead landed on the ground (impact time = 10 ms)? This force is equivalent to about 27 tons(! ), more than enough to break bones and cause fatal brain damage. Notice how crucial impact time is: Increasing the slowing-down time reduces the acceleration and the force, ideally enough to prevent injury. This is the purpose of air bags in cars, for instance. What is the resulting speed of the block? Example 5 An astronaut is floating in space near her shuttle when she realizes that the cord that’s supposed to attach her to the ship has become disconnected. Her total mass (body + suit + equipment) is 89 kg. She reaches into her pocket, finds a 1 kg metal tool, and throws it out into space with a velocity of 9 m/s directly away from the ship. If the ship is 10 m away, how long will it take her to reach it? Conservation of Linear Momentum is routinely used to analyze collisions. The objects whose collision we will analyze form the system, and although the objects exert forces on each other during the impact, these forces are only internal (they occur within the system). The system’s total linear momentum is conserved if there is no net external force on the system. Example 6 Two balls roll toward each other. The red ball has a mass of 0.5 kg and a speed of 4 m/s just before impact. The green ball has a mass of 0.3 kg and a speed of 2 m/s. After the head-on collision, the red ball continues forward with a speed of 1.7 m/s. Find the speed of the green ball after the collision. Was the collision elastic? Notice that the green ball’s velocity was reversed as a result of the collision; this typically happens when a lighter object collides with a heavier object. To see whether the collision was elastic, we need to compare the total kinetic energies before and after the collision. In this case, however, an explicit calculation is not needed since both objects experienced a decrease in speed as a result of the collision. Kinetic energy was lost, so the collision was inelastic; this is usually the case with macroscopic collisions. Most of the lost energy was transferred as heat; the two objects are both slightly warmer as a result of the collision. Example 7 Two balls roll toward each other. The red ball has a mass of 0.5 kg and a speed of 4 m/s just before impact. The green ball has a mass of 0.3 kg and a speed of 2 m/s. If the collision is completely inelastic, determine the velocity of the composite object after the collision. Example 8 An object of mass m1 is moving with velocity v1 toward a target object of mass m2 which is stationary (v2 = 0). The objects collide head-on, and the collision is elastic. Show that the relative velocity before the collision, v2 – v1, has the same magnitude as v′2 − v′1, the relative velocity after the collision. so the relative velocity after the collision, v′2 − v′1, is equal (in magnitude) but opposite (in direction) to v2 – v1, the relative velocity before the collision. This is a general property that characterizes elastic collisions. (a) Determine the magnitudes of the velocities after the collision (in terms of v). (b) Is the collision elastic? Explain your answer. 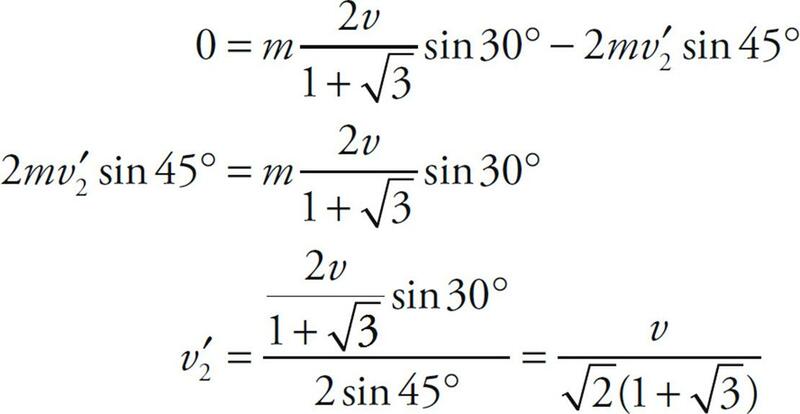 Adding these equations eliminates v2, because cos 45° = sin 45°. tells us that K’ is less than K, so some kinetic energy is lost; the collision is inelastic. The center of mass is the point where all of the mass of an object can be considered to be concentrated; it’s the dot that represents the object of interest in a free-body diagram. For a homogeneous body (that is, one for which the density is uniform throughout), the center of mass is where you intuitively expect it to be: at the geometric center. Thus, the center of mass of a uniform sphere or cube or box is at its geometric center. 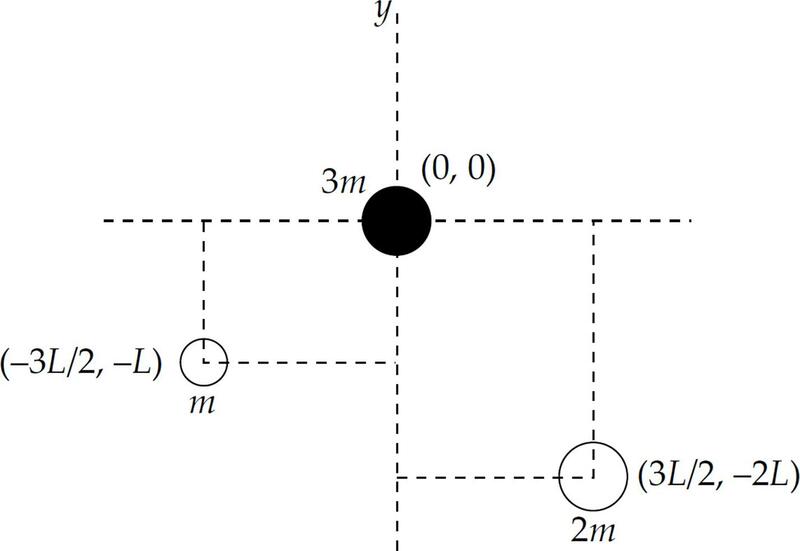 The system of particles behaves in many respects as if all its mass, M = m1 + m2 +…+ mn, were concentrated at a single location, xcm. to find the y-coordinate of their center of mass (and one more equation to calculate the z-coordinate, if they are not confined to a single plane). 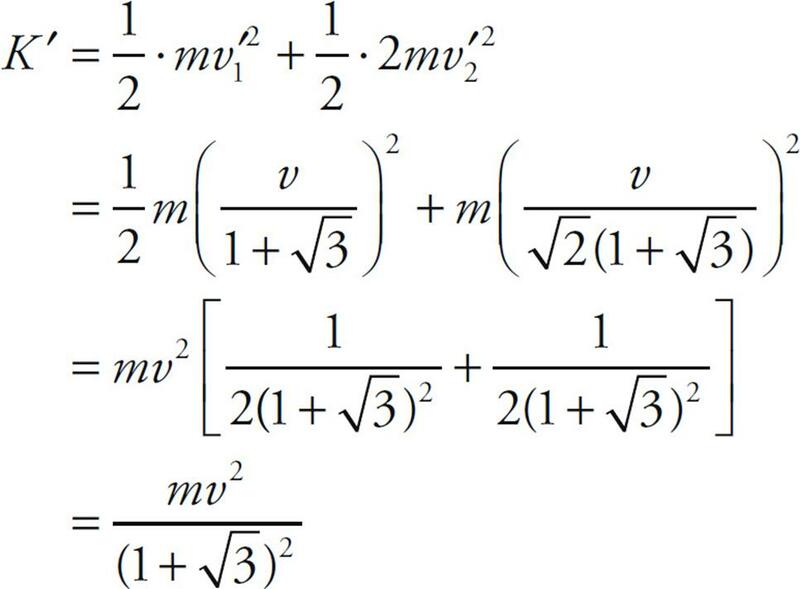 So, the total linear momentum of all the particles in the system (m1v1 + m2v2 +…+ mnvn) is the same as Mvcm, the linear momentum of a single particle (whose mass is equal to the system’s total mass) moving with the velocity of the center of mass. This says that the net (external) force acting on the system causes the center of mass to accelerate according to Newton’s Second Law. In particular, if the net external force on the system is zero, then the center of mass will not accelerate. 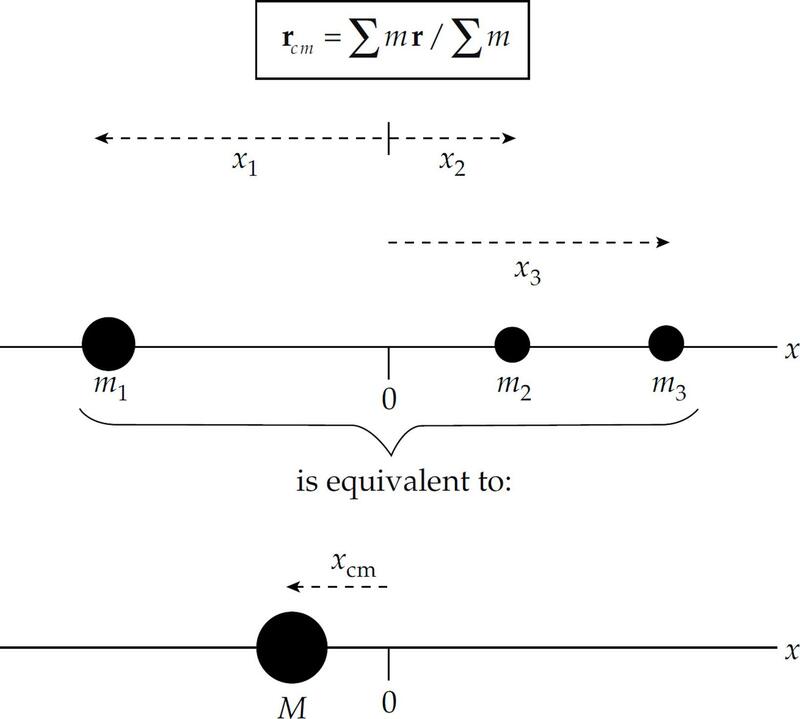 Example 10 Two objects, one of mass m and one of mass 2m, hang from light threads from the ends of a uniform bar of length 3L and mass 3m. 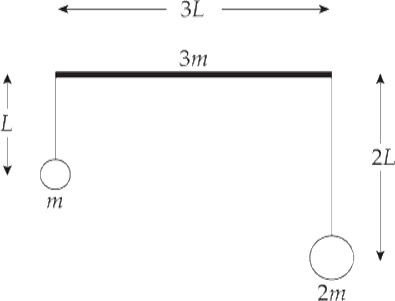 The masses m and 2m are at distances L and 2L, respectively, below the bar. Find the center of mass of this system. relative to the midpoint of the bar. 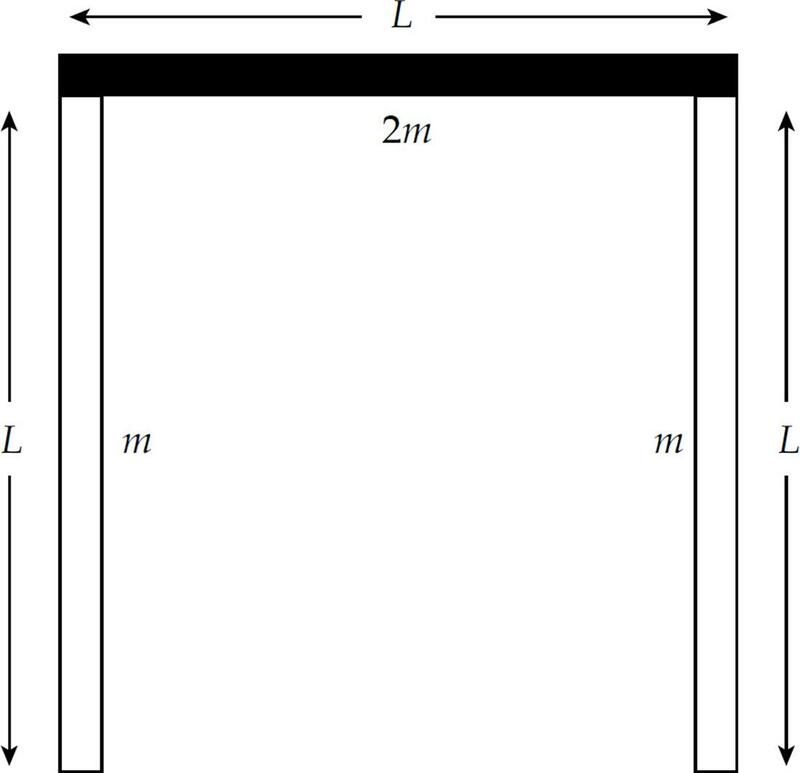 Example 11 A man of mass m is standing at one end of a stationary, floating barge of mass 3m. He then walks to the other end of the barge, a distance of L meters. Ignore any frictional effects between the barge and the water. (a) How far will the barge move? (b) If the man walks at an average velocity of v, what is the average velocity of the barge? So, the center of mass is a distance of L/8 from the midpoint of the barge, and since the mass is originally at the left end, the center of mass is a distance of L/8 to the left of the barge’s midpoint. So far we have dealt with objects that can be considered point masses, or masses with uniform density. Now we will learn how to find the center of mass of objects with non-uniform density. Take the example of a bar that becomes denser along its length. Here we will deal with the linear density λ as a function of x, λ(x). Each small segment of the bar, x, has a different mass, m. We treat each m as a point mass and then take the limit as x approaches zero. 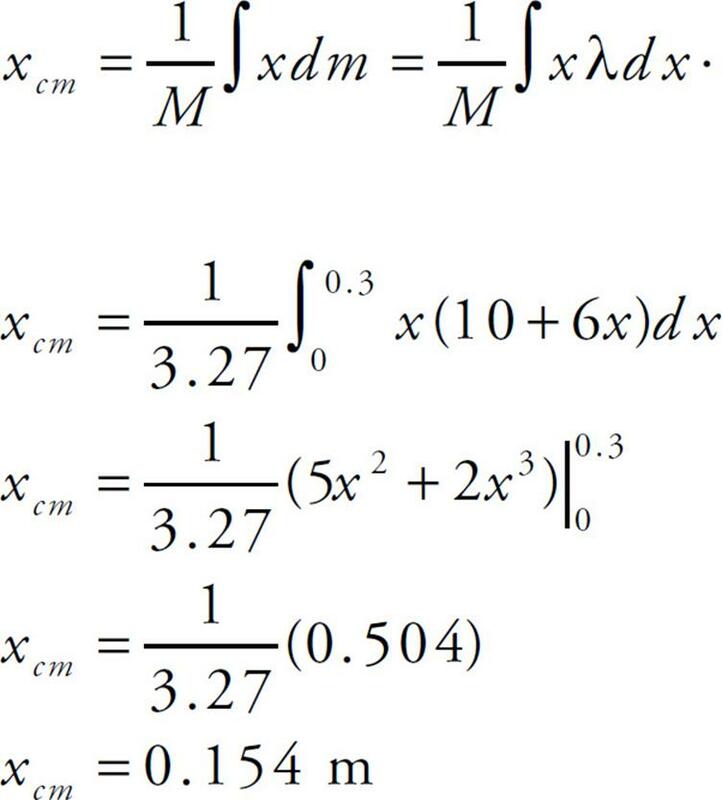 Using the formula for calculating the center of mass of point masses, and replacing m with dm, we get the integral shown below. where M is the total mass, x is the distance to each dm, and you can substitute for dm in terms of x. Linear density is mass per length, so the equation is λ = , therefore M = ∫dm = ∫λdx. Example 12 A bar with of length of 30 cm has a linear density λ = 10 + 6x, where x is in meters and λ is in kg/m. Determine the mass of the bar and the center of mass of this bar. This answer makes sense because the center of mass of the bar is beyond the midpoint. 1. An object of mass 2 kg has a linear momentum of magnitude 6 kg·m/s. What is this object’s kinetic energy? 2. A ball of mass 0.5 kg, initially at rest, acquires a speed of 4 m/s immediately after being kicked by a force of strength 20 N. For how long did this force act on the ball? 3. A box with a mass of 2 kg accelerates in a straight line from 4 m/s to 8 m/s due to the application of a force whose duration is 0.5 s. Find the average strength of this force. 4. 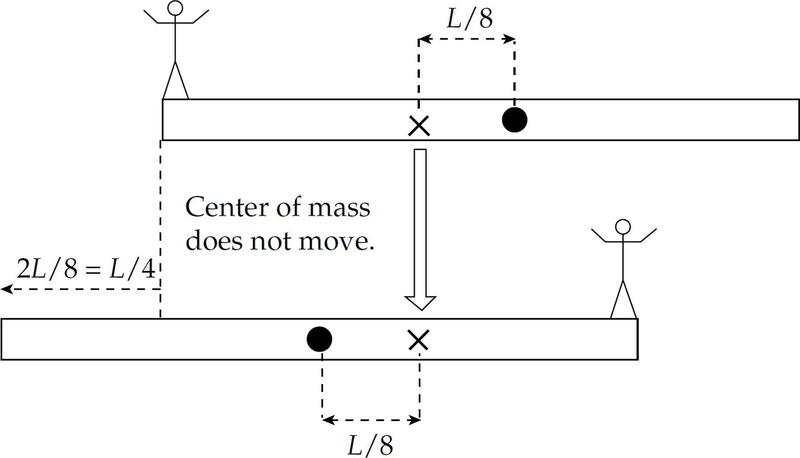 A ball of mass m traveling horizontally with velocity v strikes a massive vertical wall and rebounds back along its original direction with no change in speed. 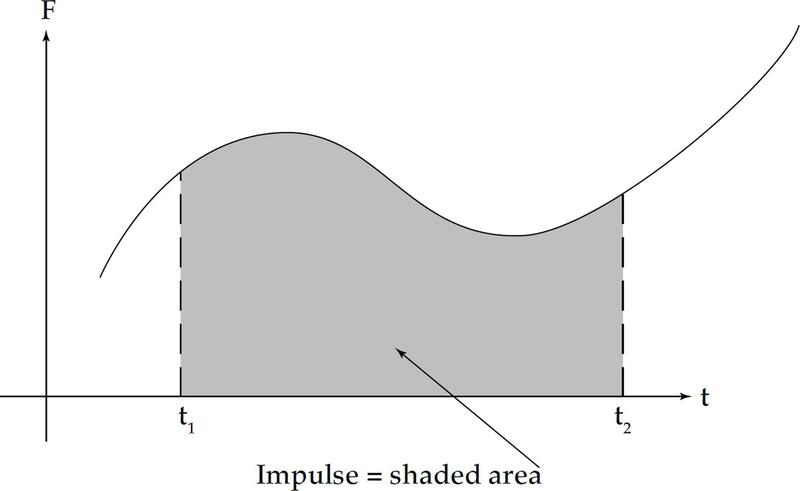 What is the magnitude of the impulse delivered by the wall to the ball? 5. Two objects, one of mass 3 kg and moving with a speed of 2 m/s and the other of mass 5 kg and speed 2 m/s, move toward each other and collide head-on. If the collision is perfectly inelastic, find the speed of the objects after the collision. 6. Object 1 moves toward Object 2, whose mass is twice that of Object 1 and which is initially at rest. After their impact, the objects lock together and move with what fraction of Object 1’s initial kinetic energy? The two rods on the arms of the U each have mass m; the third rod has mass 2m. How far below the midpoint of the horizontal rod is the center of mass of this assembly? 9. A wooden block of mass M is moving at speed V in a straight line. How fast would the bullet of mass m need to travel to stop the block (assuming that the bullet became embedded inside)? 10. Which of the following best describes a perfectly inelastic collision free of external forces? (A) Total linear momentum is never conserved. (B) Total linear momentum is sometimes conserved. (C) Kinetic energy is never conserved. (D) Kinetic energy is sometimes conserved. (E) Kinetic energy is always conserved. 1. A steel ball of mass m is fastened to a light cord of length L and released when the cord is horizontal. At the bottom of its path, the ball strikes a hard plastic block of mass M = 4m, initially at rest on a frictionless surface. The collision is elastic. 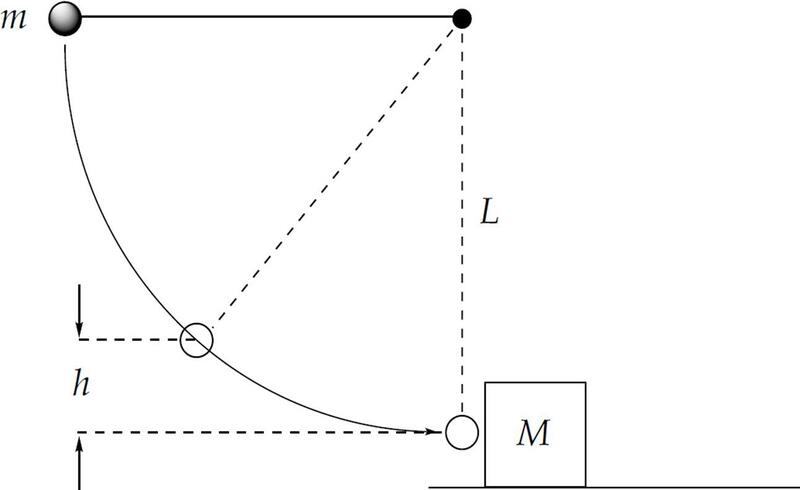 (a) Find the tension in the cord when the ball’s height above its lowest position is L. Write your answer in terms of m and g.
(b) Find the speed of the block immediately after the collision. (c) To what height h will the ball rebound after the collision? 2. A ballistic pendulum is a device that may be used to measure the muzzle speed of a bullet. It is composed of a wooden block suspended from a horizontal support by cords attached at each end. A bullet is shot into the block, and as a result of the perfectly inelastic impact, the block swings upward. Consider a bullet (mass m) with velocity v as it enters the block (mass M). The length of the cords supporting the block each have length L. The maximum height to which the block swings upward after impact is denoted by y, and the maximum horizontal displacement is denoted by x. 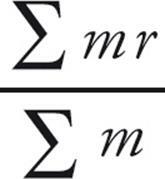 (a) In terms of m, M, g, and y, determine the speed v of the bullet. (b) What fraction of the bullet’s original kinetic energy is lost as a result of the collision? What happens to the lost kinetic energy? (c) If y is very small (so that y2 can be neglected), determine the speed of the bullet in terms of m, M, g, x, and L.
(d) Once the block begins to swing, does the momentum of the block remain constant? Why or why not? Assume that the collision is elastic. (a) If K1 denotes the kinetic energy of Object 1 before the collision, what is the kinetic energy of this object after the collision? Write your answer in terms of K1 and θ1. (b) What is the kinetic energy of Object 2 after the collision? Write your answer in terms of K1 and θ1. (c) What is the relationship between θ1 and θ2? Elastic collisions conserve kinetic energy (in general, every collision conserves energy but not necessarily kinetic energy). Inelastic collisions do not conserve kinetic energy. When the objects stick together, the collision is known as perfectly inelastic. 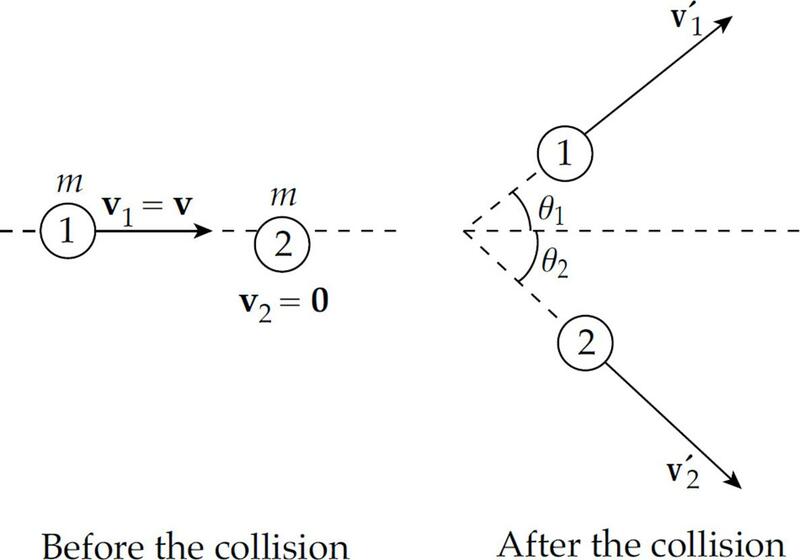 Anytime you are given a problem that involves a collision or separation, first consider whether you can use the Law of Conservation of Linear Momentum. Usually the motion of an object is describing the motion of the center of mass. When you use Newton’s Second Law, F = ma, the acceleration you calculate is the acceleration of the center of mass. For point masses, rcm = , where r is used for the position of each mass. You usually use linear density, λ dr = dm, for dm and then integrate to solve for the center of mass.